The surprise quilt. A success! 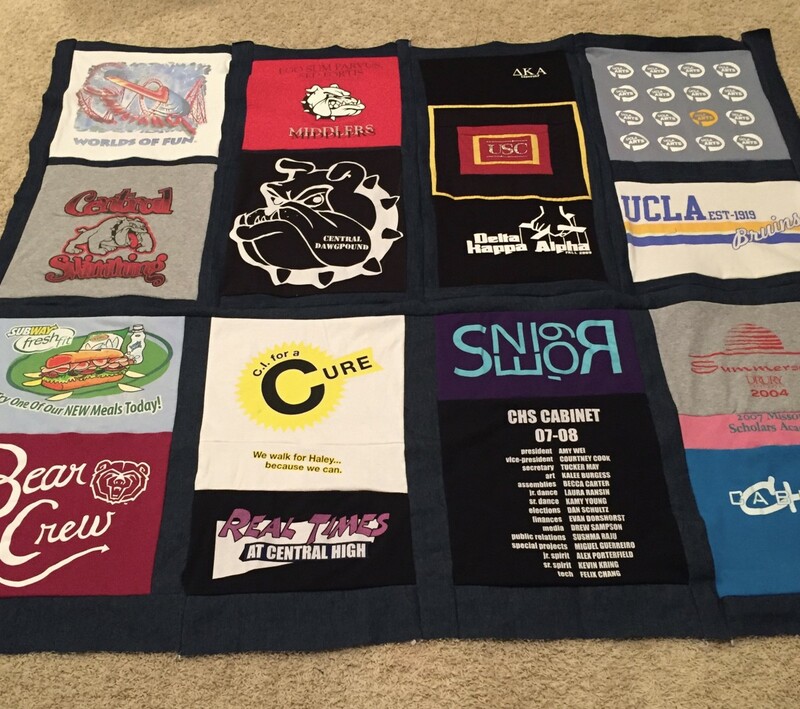 Decide the size of memory quilt you want to make - or let the number of t-shirts make the decision for you. I opted to make a not-quite-full-size quilt. Any smaller would not have served my purpose, and any larger would have been more difficult for travel. Decide your theme. I chose his many high-school clubs and his college visits. There is also a part-time job, a reference to us (his parents), and some trips. Look in closets, trunks, drawers, window seats, basements, garages, and attics. Maybe under the bed? Laundry hamper? Freezer? If you are more fastidious than our family, you're good to go. Otherwise, a final wash may be a good idea. And of course, dry thoroughly. 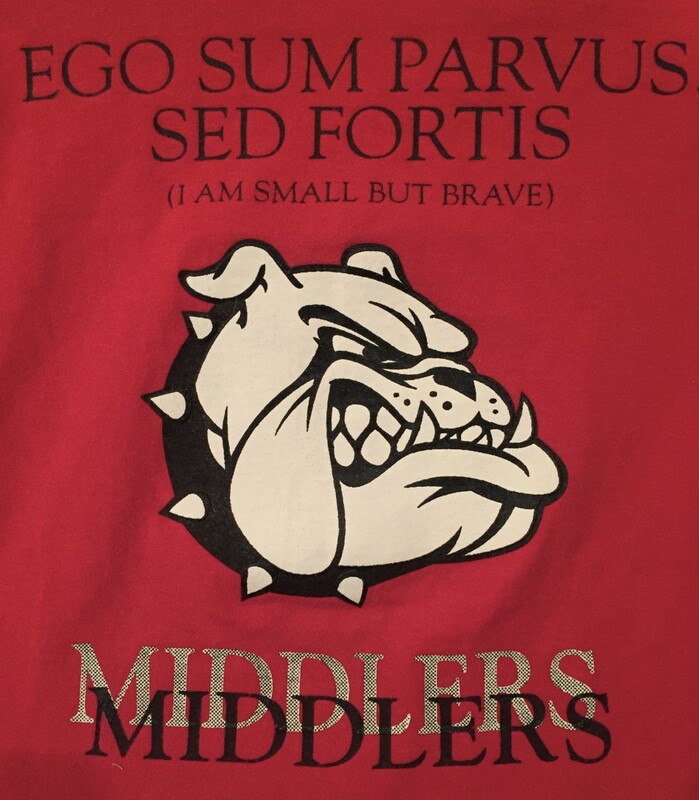 T-shirts can be more annoying than sweatshirts as far as square sizes, especially if child-size t-shirts are being used. You can usually get a good square from a teen or adult sweatshirt, however t-shirts may have a small design between the arm seam and the neck, or a certain logo positioned for an odd-cut-out. It doesn't matter. Just cut. 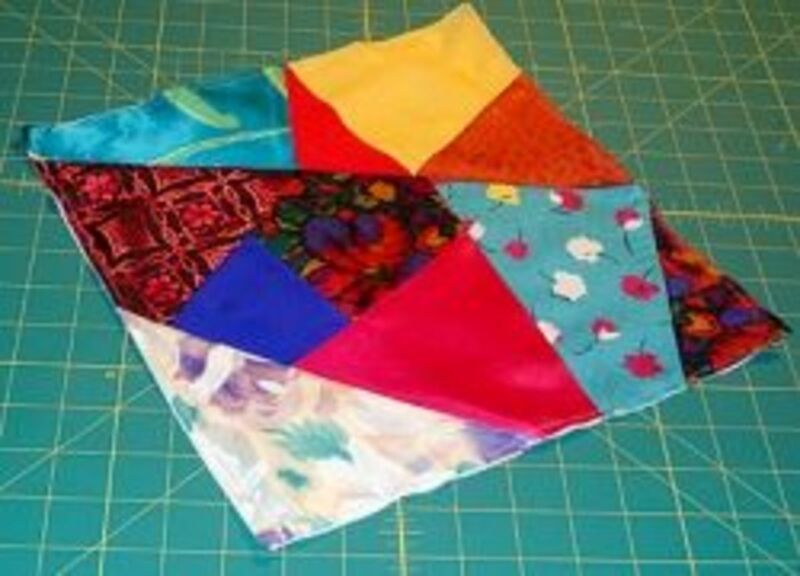 You may choose to use some to fill-in some bare spots for the quilt. 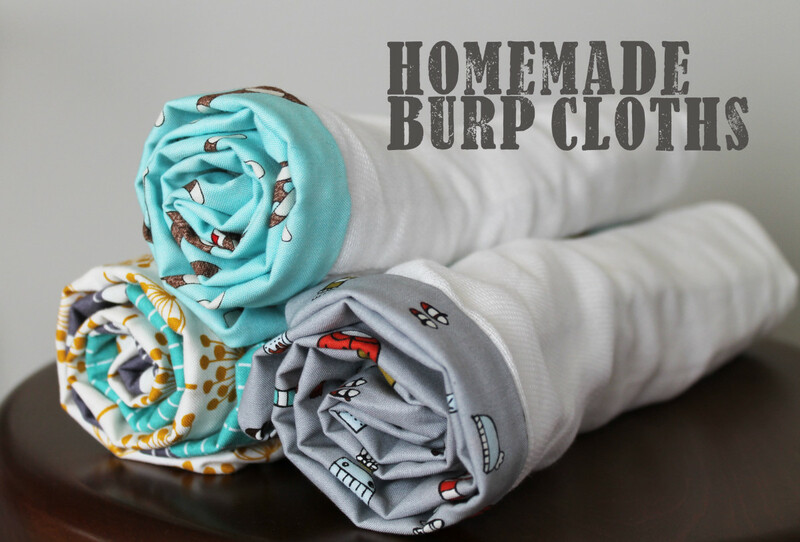 Otherwise, large scraps make dust cloths and cleaning rags. The ribbed necks can used as headbands to keep your hair out of your face when you're washing your face. I do this when we go camping or other travel. Then I don't have to worry about losing it. 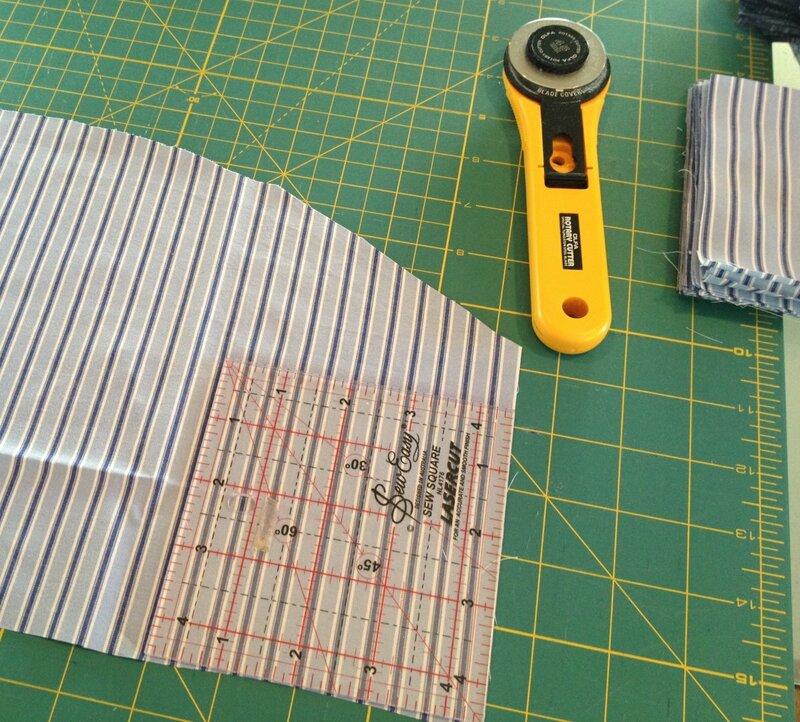 The hems of the sleeves and of the shirt bottom can be used on other sewing projects if you're crafty that way. I wanted an "Americana" quilt. What says American more than t-shirts and jeans? 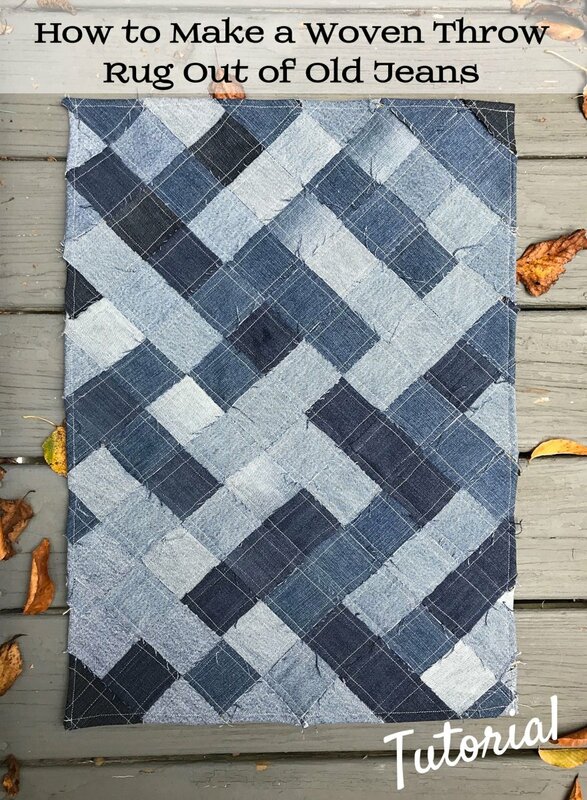 Ergo, I decided on denim to border each of my quilt pieces/sections. I used a pair of my old jeans and cut them into strips. I didn't have quite enough so I needed to purchase this mid-weight denim. Choose whatever will work for you. Since all the pieces are (generally) a light-weight knit, choose at least a mid-weight woven to keep the shape when finished, and also to help from shifting during sewing. Note: I used my serger for all piecing. 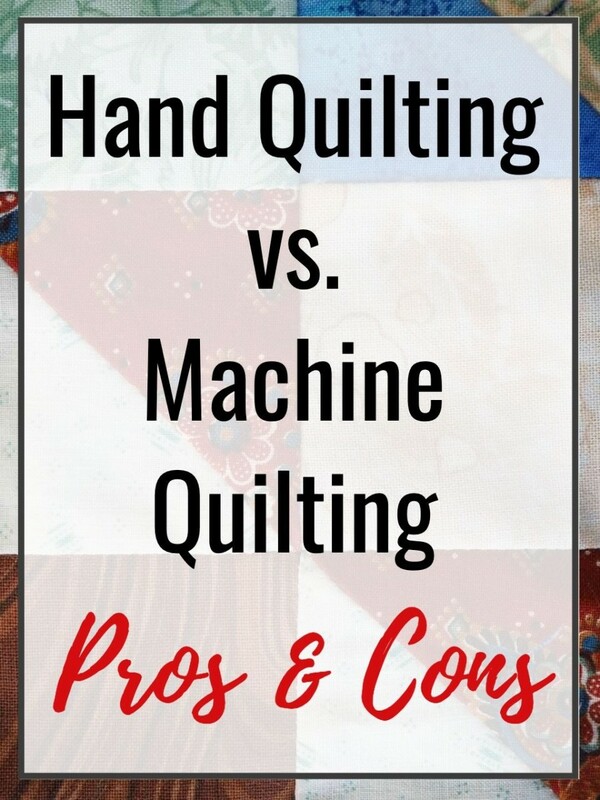 The outside binding and "quilting/securing" were a straight stitch on a regular machine. 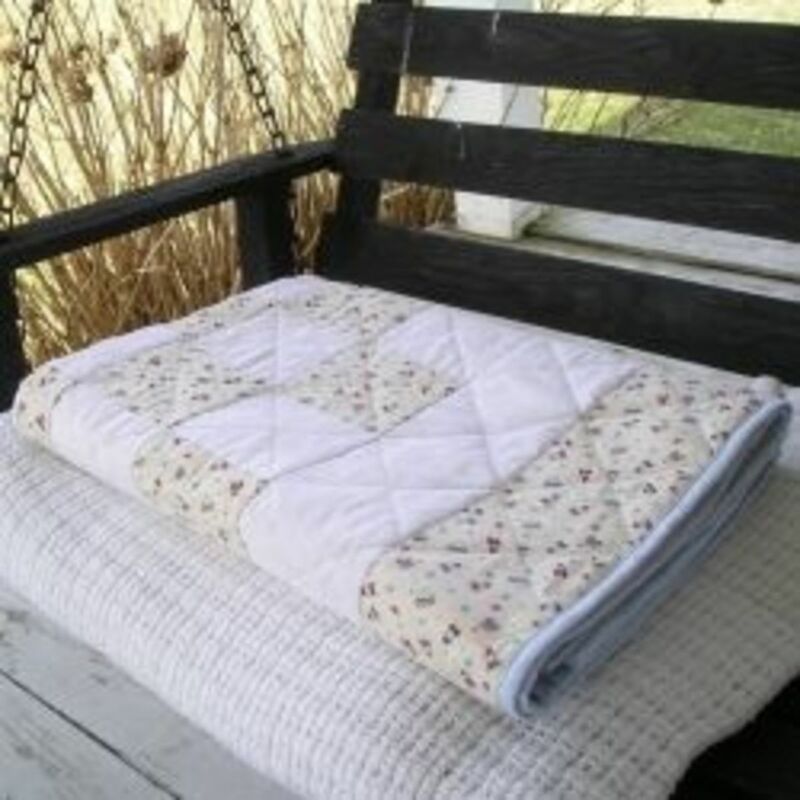 A regular machine can be used for the entire quilt. I wanted to represent a certain summer camp for the three years our son went there. Each year had a different logo. I didn't want three full-size pieces of essentially the same thing, but I did want the reminders. If you look in the photo below, you will see I pieced three of those cut-outs into one piece before adding the denim border around all of them - the gray, pink, and blue pieces in the bottom right corner. These three then became one piece. I did something similar with other pieces - basically piecing smaller pieces together, some with a small internal border, some without. These pieced-pieces then began to take on a rectangular shape of a similar size. I saw that any difference in sizes could be adjusted with the denim borders around each final piece/section. You may also have odd-sized or odd-shaped pieces. That's okay. 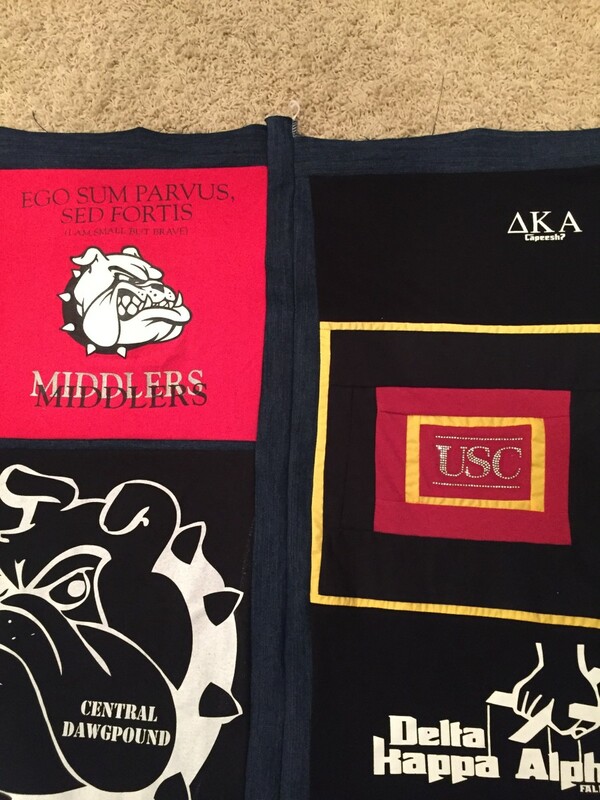 Square them up with other cut pieces, or with border fabric. They can all work out. I needed to do something with the USC piece, where he graduated with a degree in Cinematic Arts. (Yes, we're proud parents). This "USC" emblem was very small. To make it useful, I put a couple of special borders around it using the colors of USC - Gold and Cardinal. Since I had decided to incorporate this piece with the front and back of a black t-shirt, I added a wider black border with a final gold border to make it stand out. I sewed this in-between the black pieces making one large piece that then has the denim border. Note: The final gold border is a woven fabric which helped stabilize it between the two black knit pieces. You may need to do something similar between knit pieces. These pieces represent 6th grade (high-school) through college graduation. Each year, about 30 kids from our city are chosen to enter the IB Diploma program, essentially starting high school at age 11. Yikes! This is a very individual choice. You may want a very heavy quilt like my Grandma used to make. Use a thick batting inside and fleece or flannel backing. I loved the heavy weight of her quilts! You might want mid-weight batting and a "regular" cotton backing. Good choice.1 Remember to wash and dry your backing, but not the batting. So many "b" words! I needed to travel with this on a plane, so weight was a concern. I opted to use a sheet for the inside and a second sheet for the backing. This served two purposes. It lightened the load for the weight limit and made it workable to finish the whole thing on my Montgomery Ward sewing machine. (Haven't heard of that store for a while, have you)? This was the point where I did need to use pins to keep the three layers together. For this, I used large safety pins instead of straight pins. I needed to fold, re-fold, roll, and re-roll my layers while "quilting" which was basically a stitch-in-the-ditch beside the large rectangles that finally emerged. The backside was not exactly elegant. 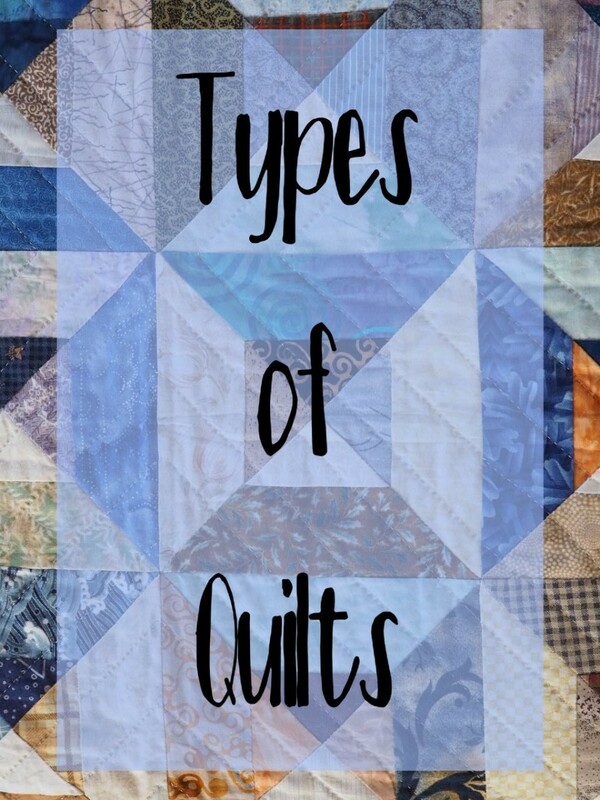 You may have a quilting machine or a local shop with equipment to help you out. All the better. Just know that you can do this, even by hand. That's the way our fore-mothers did it, right? Once you've secured your layers, you're ready to finish. I decided to put a binding around my quilt. 1However, you could incorporate that into the "backing" step. If you decide to do that, stop the prior steps after securing the middle layer - the batting. At that point, place the right sides of your pieced front to the right side of your backing fabric, sew 3/4 around, turn, and finish the opening. You'll then want to tack/quilt/secure the front and back. Of course if you are so inclined, you can make your own quilt binding. I have done that. It's time consuming and may take more fabric than you want to deal with. That's why bias tape was invented. I chose this wide bias tape to forgive any unevenness on my quilt. I chose black because I didn't want the navy color to "almost but not quite" match the denim. One side of the fold is wider than the other side of the fold. Place the wide side on the bottom and stitch along the edge on the narrow side, which is now on the top of your fabric. Like a little sandwich. At the corners, just create a mitre on the fly - you don't need to cut and re-sew. Just tuck and sew. 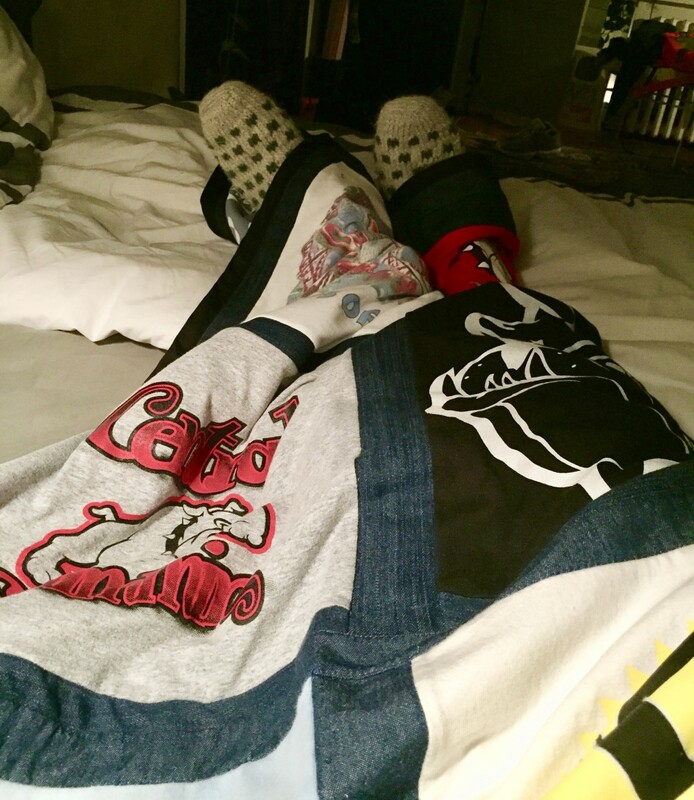 You'll know you were successful when you get an email with a photo of your memory quilt in use during a Berlin winter. I guess a quilt can be warm in more ways than one. 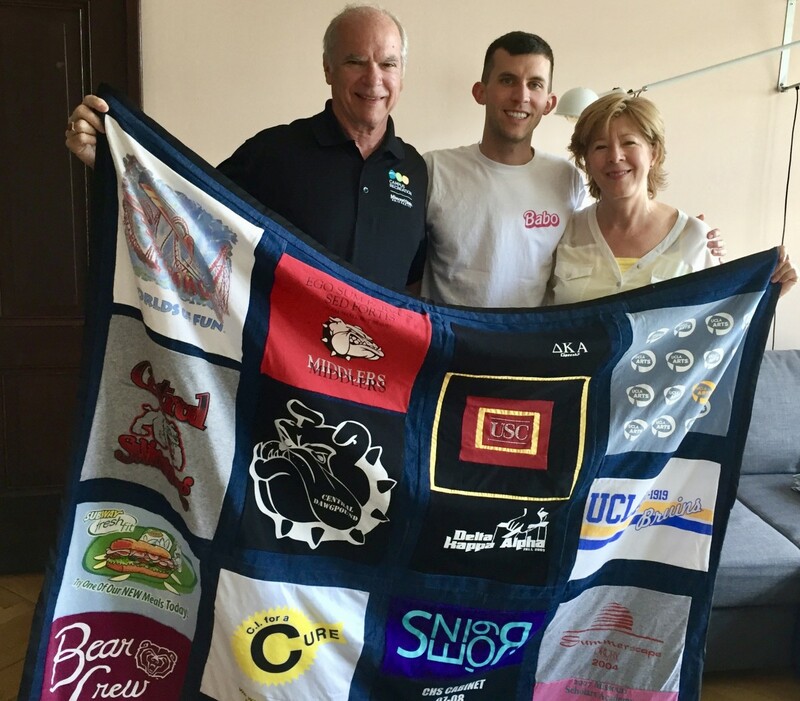 T-Shirt Memory Quilt In Use. Thank you very much. If you look on my profile you will see other similar articles. Amazingly written. Let us know when you are done. Keep posting such articles.